Time Magazine, June 19, 1972. Used with permission. OK, so the blog has suffered while I tended to our second daughter Anna, a conference anthology for Oxford UP (due in September) and my dissertation (due in a week or two). I apologize. To supplicate, I post this (written) interview I have done with John at TheoFantastique – a great blog on occulture and popular culture. The article we discuss is this horror from The Telegraph, March 30, 2011. Here, the “surge” in Satanism online and the resultant accessibility of Satanism is linked to increased demand for exorcism. It is good we have the Catholic Church to help us with classical products in a time of need. This is the final draft; if you want the pretty version, do visit TheoFantastique. Lots of zombies too. TheoFantastique: Jesper, thank you for making some time to discuss your research as it relates to current events in popular culture. Recently an article in The Telegraph in the UK reported on an alleged rise in Satanism, and according to the Roman Catholic Church, a corresponding need for more exorcists as a response to alleged increases in possession. There is a lot to unpack here, but let’s look at the various elements of significance here. To begin, what type of research have you done on Satanism, can you define Satanism in terms of your research, and has there indeed been any kind of rise in Satanism as the article reports? Jesper Aagaard Petersen: My research focuses on modern religious Satanism, a heterogeneous assortment of individuals, groups and networks using Satan and other mythological beings as a short-hand for their work on the Left-Hand path. This manifestation of Satanism is recent, only gaining ground and formalization during the occult revival of the 1960s; the most well-known exemplar is of course Anton LaVey’s Church of Satan. Even so, there are many other interpretations alongside LaVey’s – some are atheist and materialist just like the Church, others are explicitly theist, although it often takes a Gnostic or esoteric form rather than a direct mimesis of Christian stereotypes. And there are positions in between. I tend to distinguish ‘rational’ and ‘esoteric’ Satanism as fully developed, autonomous and organized types of religious Satanism. These types should in turn be separated from ‘reactive’ Satanism, which is the (often deeply meaningful, yet fragmented) Satanism of the pact, the teenage bedroom and the black metal concert, and from various demonological discourses on the satanic throughout history. My studies are primarily based on texts, websites and message boards, but I have complemented these sources with both ethnographic, sociological, and media work. What I do is study the discourses and practices of religious groups through the resources and strategies they bring into the struggle to actually define Satanism. As such, I see contemporary Satanism as a satanic milieu of people, organizations, ideas, practices, and channels for communication. This satanic milieu is both separate from and in dialogue with modern occulture and the wider cultural narratives on the satanic. It is distinct, because modern religious Satanism is about the self and not some diabolical ‘other’. The mythological beings used in this identity work have been disembedded from their original context and ‘de-otherized’ (to use J. Laycock’s term). Satan and Satanism are no longer solely defined within a Christian context. As such, ‘Satanist’ has followed the same trajectory as ‘witch’, ‘vampire’, ‘pagan, and ‘queer’, to name a few. Rather than positions of (dangerous) inversion, they are now hybrid roles, used within both cultural narratives of the other and as identities for the self. On the other hand, we should acknowledge some dialogue as well. First of all, dark occulture and cultural narratives do work as pathways to and from the satanic milieu, as Satanists engage with both subcultural and mainstream representations and take what they resonate with. Conversely, real Satanists are not totally below the mainstream radar, even if the media representations are sketchy at best and work more along the lines of freak show exhibits. Although I can say with confidence that theories of slippery slopes are mistaken, these relations thus make popular culture one important socialization ‘stage’ for modern Satanists. Regarding the rise of Satanism, that depends on how you define it. The article you mention calls it a “surge” and a “revival”. It is true that the 1990s and early 2000s saw an increase of interest in Satanism alongside Witchcraft, Neopaganism, and other religious currents with roots in esotericism and occultism. This has to do with the general re-enchantment of the West in the past 50 years (an enchantment that never really went away, actually, but that is another story), which has developed in dialogue with popular media. It is also true that Satanism is more visible and more accessible because of the Internet, and that it flourishes on the de-regulated arenas the Internet provides. On the other hand, membership figures are hard to come by, and should be seen in relation to degrees of affiliation – a majority of witches or Satanists are tourists or dabblers, and only a small minority affiliate with a group and/or develop a long-term engagement. It is likely that more people are attracted to Satanism than before, and they are more visible today, but actual members still amount to thousands and not millions. In any case, where I differ from the article’s conclusion is in the effect of mediated religion on susceptible youth. Watching a movie, accessing a website or participating in a discussion forum does not automatically make you a Satanist, and it certainly does not make you possessed. TheoFantastique: Is there any reason to make a connection between Satanism in its various forms and the occult and the phenomenon of possession? Jesper: Well, the simple answer is no. The article in The Telegraph caught my eye, as it fits the recurrent dialectic between real satanic groups on the one hand and anti-satanic discourse on the other, a dialectic covered by for example Phil Jenkins in Mystics and Messiahs (2000). Satanism as a religious option is definitely more visible and has been so since the 1960s witchcraft revival, in no small part because of LaVey’s Satanic Bible and the high media profile of the Church, as well as the meteoric rise of the Internet. On the other hand, the satanic panic and ritual abuse cases of the 1980s and early 1990s did much to reposition anti-satanic discourses of evil as the default interpretation of Satanism. Even though the religious (mainly evangelical and to a lesser degree catholic) basis of the moral panic has been exposed, and the secular madness of the media, law enforcement, judicial, education, and social care systems has been criticized extensively, conspiracy and scapegoating remains as a cultural resource. Satanism remains associated with evil in popular discourse and culture. That is why I have a problem with the phrase “rise in Satanism” and “occult” in the article. The connotations become conspiratorial and not statistical. The word occult has a specific meaning within Religious Studies tied to the etymology of the word, as hidden. But in popular parlance and Catholic research it has a sinister ring to it. The article posits an causal connection between ease of access and demand for exorcists, but I think a lot of elements are missing from that equation. We have to ask who is searching online and who is in need of an exorcist? Are they even connected? Who makes the connections? There has been a re-enchantment of sorts, and it could of course be interpreted as the work of a cabal of Devil-worshipers influenced by demons. But there is absolutely no reason to see a rise in Satanism, Witchcraft, holistic spirituality and whatnot as anything sinister. Here, modern religious Satanism and the theological discourses on the satanic are two entirely different animals. On the other hand, a higher visibility of things dubbed “occult” and explicitly diabolical might stimulate a higher rate of possession experiences in evangelical and Catholic communities. Certainly the interpretation of possession is connected to cultural resources at hand. And by extension, possession narratives are in fact reported in movies, talk-shows and so on outside these milieus. But then we have moved our attention to very different arenas of religiosity which is not directly associated with the people I study, namely Christian communities and the ‘secularized’ paranormal demonologies of horror movies (The Entity (1981) or Paranormal Activity (2009), for example). TheoFantastique: I too have noted the continued presence of the devil, possession, and spirit entities in various horror films and television programs. This relates to what has been labeled as popular occulture. Why do you think the devilish in popular occulture is so prevalent, and how might this not be a factor in reports of the need for exorcism? Jesper: The Devil and his minions certainly sell. They are protean figures that can be molded to fit your narrative needs. And all narratives need bad guys, so why not use the Devil as has been done in popular culture for hundreds of years? Various elements of Christianity are topoi we all recognize (or at least most of us): The savior, the corrupted, the alluring, the end and so on. In addition, social anxieties and the speed of change needs a narrative interpretation. But this is cyclical. The 1960s explosion spawned not only the somewhat eccentric satanic witch of Rosemary’s Baby (1968), but also the unabashedly evil Antichrist of The Omen (1976) and the home invasion of The Exorcist (1973). And then came Michelle Remembers (1980), Multiple Personality Disorders and the MacMartin Preschool. Although thoroughly dismissed, these “real” stories never really went away, they just went back to the milieus from which they emerged, and, crucially, into popular culture as fictional tropes. They also underwent secularization: Aside from explicitly religious demonic fantasies, they continued as spiritual or paranormal narratives. For some two decades, anti-satanism has slumbered, while we have witnessed a resurgence of occultural themes in popular culture and as religious currents. This fin-de-siecle reenchantment is now met with The Exorcism of Emily Rose (2005), The Last Rite (2010), and The Rite (2011), to name a few recent movies. Hopefully we will stop before the next stage. Of course things are more complicated than this. Yet, we have to see reenchantment, the mainstreaming of occulture and the conservative reaction as parts of a whole. In a sense, the periodic resurgence of exorcism and other re-enchantment reminds me that we are not that far removed from Hellenistic times. They too ascribed everything to demonic influence, in part because of the changes they experienced. Nevertheless, to argue that movies or the Internet makes demon-possessed victims in need of exorcism is the worst kind of hypodermic needle-argument on the effect of popular culture. We appropriate culture according to need, context and previous experiences. Of course, the Catholic Church has the Devil and his demons pushing the needle, so all constructivist and reception theory arguments are in vain. TheoFantastique: What kind of conclusions do you draw as a scholar about the kind of sensationalistic and inaccurate reporting in The Telegraph article, as well as that produced by the Catholic Church about this phenomenon? Jesper: First of all, that causality is still a misunderstood phenomenon. A simultaneous decline in storks and child births does not prove that children are brought by long-legged birds. But such “explanations” are easy to sell. Further, it proves that popular accounts of academic research on Satanism and other occultural phenomena are sorely needed. While I have little confidence in the “seriousness and scientific rigour” of the Vatican conference, it obviously has a stronger network in which to promote its views. I might scoff at this article (I did yell at the computer screen when I read it), but it is read by a far wider constituency than any article I have ever written (all of them combined too). Ultimately, these things move in cycles. 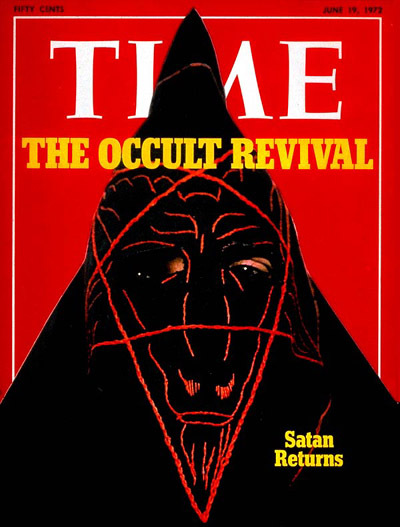 In the famous 1972 Time magazine article “The Occult Revival: A Substitute Faith”, many of the same issues are reported. They even comment that the UK is experiencing such a boom in witchcraft and occultism that the Anglicans and Catholics have convened to suggest the appointment of exorcists in each diocese. Sounds oddly familiar in 2011. It is all about social mobilization and the reframing of perceived social problems. The Catholic Church is at odds with a dominant subjectivist trend in modern culture. At times, it tries to accommodate it. At other times, it rejects it and reframes it a social and moral decay. The availability and visibility of Satanism online is an easy target. When connected to the unrelated rise in exorcism movies and popular interest in spirits, demons, and – well, old-school fire and brimstone – a false causality is formed. TheoFantastique: Jesper, thank you for your time and thoughts on this. It has been a while. I wanted to blog on the movie 9, but I couldn’t get my head around it – strange post-apocalyptic imagery, a rather conventional narrative and allusions (and direct references) to Paracelsus and esoteric conceptions of body, soul and spirit, combined with a somewhat gnostic metanarrative. Great movie, anyway. Instead, I put my energy into closing my re-reading of Philip Jenkins’ historical beauty, Mystics and Messiahs. 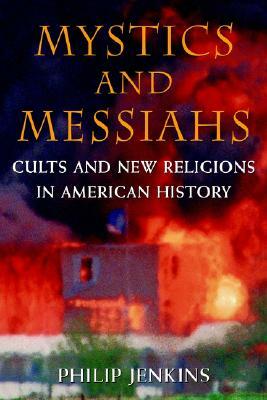 Cults and New Religions in American History (OUP 2000). I slated it for re-assimilation (with a pen this time) because of two things. Firstly Manly Palmer Hall; Sahagun made a few references to it, and it seemed natural to move from close to distanced analysis of the cultic milieu in space and time. Secondly I skimmed D. Frankfurter’s Evil Incarnate (Princeton 2006) and Jenkins’ short piece on Satanism in J. Lewis’ Oxford Handbook on NRMs (2004) when I wrote an article on Satanism, violence and transgression; this made me recall how valuable his analysis was, especially for another article on Satanism, popular culture and the use of H. P . Lovecraft (the violence piece will be published by OUP in the book Violence and New Religions, the second one in a book from Brill, although I am all too late). In a sense, Mystics and Messiahs is gray and patiently documentary as we move through the cycles of cultic innovation, societal reaction, moral panic, temperance and new innovation. Understandably, this is very entertaining anecdote-wise. The period covered is about 1800 to 2000, where the wheel turns at least 4 times – panics arose around 1830, 1870, 1930 and 1980 with “awakenings” around 1800, 1850, 1880, 1920 and 1960 – although the book concentrates on the parallels between the interwar years and the cult scares of the 1970s and 1980s. Nevertheless the value of Jenkins’ analysis is not in the details provided, although they are many, but in the scope of his analysis, the observed pattern and the attention to popular culture and occulture. Regarding scope, I really like books that synthesize a lot of information; that makes my own synthesizing a lot easier. Jenkins is well read and covers important as well as striking groups and individuals with small vignette-like discussions, while frequently backtracking and connecting rhetorical tropes and specific trajectories. I got a real sense of the importance of California, the “cult milieu” and the rise of tabloid media through his chronological treatment. Theoretically, Jenkins lies between the more economic and market-oriented analyses of eg. Stark and Bainbridge (The Future of Religion, 1985 is a good collection) and the more discourse-oriented milieu-centric analyses offered by C. Campbell, Roy Wallis and later Chris Partridge (read The Re-Enchantment of the West, vol. 1-2, 2004-5). On that note, I never liked the definitions of “cult” and “sect” provided by Stark and Bainbridge; connection to “established” religious institutions and recognizability seems too theological to me. On the other hand, their distinction between “audience cult” (one to many, mediatized), “client cult” (one to one, privatized) and “cult movement” (imploded) is brilliant, specifically when combined with the cultic milieu as background. Roy Wallis’ criteria of epistemological authority and societal tension are much more useful, because groups designated as cults and sects are able to evolve within the conceptual scheme of cult, sect, denomination and church. In essence, Stark and Bainbridge make a theological evaluation, while Wallis makes an organizational one. With Wallis, “cult” and “sect” are polar opposites on a scale, but they can evolve into each other; with Stark and Bainbridge, “cult” and “sect” are logical opposites because of their relation to mainstream society and origins. Thus, a cult can become a church and produce sects, but cannot become a sect in itself, as a cult is produced by fission, innovation or “sporulation”, and a sect by schism. So both use Campbell’s “cultic milieu”, but in very different ways. Stark and Bainbridge concentrate on religious vitality in the west; when traditional religion is strong, sects are prolific; when traditional religion is weak, cults form. Apparently cults cannot imply schism (although a break from the cultic milieu itself is common – look at the rhetoric on Anton LaVey and the Church of Satan after 1975, for example). In contrast, Wallis looks at new religious movements and categorize them according to internal and external criteria: If totalitarian and leadership-prone, sect; if tolerant and individualistic, cult. Both form from established organizations and the cultic milieu. Luckily, they can be selectively combined, and I do so in my classes on new religions as a market-perspective, with practitioners, participants, audiences, clients, shops, confidentials and fairs; a milieu-perspective, with tourists, seekers, entrepeneurs, submilieus and occulture; and an organizational perspective, with NRMs, apostates, leaders, devotees and so on. Here, Stark and Bainbridge grows out of Wallis’ initial demarcation, and it seems to work. No textbook in the typewriter yet, though. All of this is somewhat irrelevant for Mystics and Messiahs, but it felt good to get it out. And a good thing is that Jenkins also selects quite irreverently from sociological theory. He doesn’t care about distinguishing cult and sect (p. 12-18 and note 16 and 18 in ch. 1), and it doesn’t matter until the last chapter, where I feel his future suggestions “towards respectability” is strictly about sects (p. 227-30) and the discussion about mainstreaming in “oddity and orthodoxy” is about cults and the cultic milieu (p. 230-36). The “cult(ic) milieu” (p. 6, 8-10) and Stark and Bainbridge’s tripartite cult-categorization works fine together with a moderate constructivism, especially regarding anti-cult rhetorics on social problems. This takes me to the second value of Mystics and Messiahs, namely the suggested pattern or “eternal return” of cult emergence and anti-cult reaction (see p. 13 for the basic model). One funny thing about prognostication is sitting in the future and reading about it – Jenkins suggests a new peak in cult emergence around 2010 (p. 20). If so, I have a job. On a less silly note, there is something really cool, almost psychohistorical about this sociological model. Even if hard-line nomothetical interpretations are discarded, there still remains a cycle of innovation and reaction, where new turns both ignore and selectively appropriate earlier cycles, which is brilliant for prognosis. On the one hand, memory is preciously short-ranged – a generation or so. Apart from a few historians, sociologists and movie-buffs, nobody remembers the shudder invoked by “voodoo cults” in the 1930s and 40s. When I teach about NRMs, no student knows who the Moonies are and how terrifying they seemed to “regular folks”. The pattern and the recurrence of rhetorical claims of anti-cult activists are thus a colossal blind spot in both media and policy making, as well as for people at large. On the other hand, there is a selective appropriation of material from earlier periods, both in cultic innovation and in anti-cult rhetoric. For example, the claims of voodoo cults, human sacrifice and ritual murder in 1940s pulp fiction are reproduced in the 1980s Satanism scare literature (p. 135-48, 214-15), and the theory of the cultic milieu specifically targets the wider “cultic memory reservoir” from which cults and sects construct and disseminate their discourse and practices (as well as recruit members). The whole point of proposing occulture in a cultic milieu is to call attention to what lies beneath individual cults and seekers. As such, the book’s extended scope that reaches back to the 1600s facilitates a backtracking which shows the limits of human imagination quite nicely; atrocity catalogues are rather narrowly defined, as are most occultural ideas and practices. For example, Thomas Edwards Gangraena (1646) anticipates most modern cult beliefs and practices as well as anti-cult claims – and yes, he equates heresy to gangrene. Now we arrive at popular culture and occulture, the third aspect of the book worth mentioning. In contrast to other studies of cults and anti-cult movements, moral panics and demonologies, sociology takes a back-seat to historical reflection of mediatized networks. It is still sociology, but of a more ideographic kind. Good examples are the chapters “Black Gods” and “The Cult Racket: Anticult Campaigns, 1920-40”, which gives the reader a very interesting background for the present-day worries through a detailed analysis of charges: Confidence tricks, sexual perversion, insanity, primitivism and murder. The material spans anti-cult literature, pulp fiction and newspaper exposés, and provides us with a much more comprehensive catalogue of “cultural paths” into the rhetoric of the “killer cult” through re-interpretations of cults from exotic other to local threat. This view is promoted by popular movies, journals and books. As today, you do not have to be a fundamentalist Christian cop, worried social worker or daring reporter to be influenced by anti-cult claims; rather than actively seeking information, we are passively “primed” by it, as it is disseminated in popular culture. This aspect also infuses Jenkins’ discussion of the cultic milieu; for example, the chapter “The First New Age” illustrate the fermentation in the cultic milieu 1870-1920, both through material from the spokespersons themselves and from popular receptions and reinterpretations. As with the biography on Manly Palmer Hall, we get important genealogical trajectories of religious imagination from historical studies such as these, as well as a much more contextual understanding of “conversion” and “recruitment” (or “fit” and “priming”). Esoteric and alternative currents have been here for hundreds of years and they have been popularized for at least 150 years by both adherents and sensationalists. An interesting dimension is that both NRMs, anti-cult groups and the general public actively and passively engages in what Michael Barkun calls “fact-fiction reversal” (see A Culture of Conspiracy, 2003). In conspiracy culture, he writes, fictional narratives are consistently read as fact (as true accounts of motives, subtle indoctrination or desperate attempts at disclosure), while academic knowledge in general, and especially factual intervention, is considered fictional (as cover-ups or misdirection). This can be translated into a general strategy in the cultic milieu; H. P. Lovecraft’s Necronomicon, for example, and the Cthulhu mythos around it, is used both naively and reflexively as a “true” esoteric current to be used as philosophical literature, symbolic thinking or ritual components. Al Azif and the Necronomicon has been published several times, and the Cthulhu mythos figures in rationalist Satanism (see A. LaVey’s Satanic Rituals, 1972, p. 175ff and Barton’s The Secret Life of a Satanist, 1990, p. 159ff), esoteric Satanism (see M. Aquino’s The Church of Satan (p. 177ff, 617-19, 654-57, 691-710) and Temple of Set (351ff) e-books or the website of the Satanic Reds here and here for good examples), Left Hand path ritual magic and Chaos Magick (Stephen Sennitt’s The Infernal Texts: Nox and Liber Koth, 1997, includes texts from “The Nameless Sodality” on Cthulhu mythos) etc etc. The frequent appeals to EOD (Esoteric Order of Dagon), The Starry Wisdom Sect and other Lovecraftian groups are also, aside from the obvious appeals to tradition, curious fact-fiction reversals, as new groups with these names substitute fiction with social fact. As a side note: Although most groups (eg. the Church of Satan) sharply differentiate outer reality and the imaginings of the ritual room and thus retains some sort of genre specificity, some unaffiliated seekers, especially younger ones, go beyond play and into delusion. That is no problem in itself (all religion is willing delusion, so to speak), but it becomes a problem when some invisible line is crossed. The same can be said about the frequent appropriations of traditionalism, fascist aesthetics and nazi occulture; there is “play with gray” and there is unhealthy political leanings. An interesting socio-psychological study could be made on these crossings – perhaps Keith Kahn-Harris’ reflexive anti-reflexivity is a starting point? And on a discursive level: when is play with nazi trappings fun or educational (esoterically speaking) as transgression and deconditioning, and when is it a smoke-screen for political idiocy? To get back to fact-fiction reversals: Parallel to occultural appropriations, however, Lovecraft and the Cthulhu mythos, alongside William Seabrook and Zora Neale Hurston, for example, keeps alive notions of racial atavism, primitive backwater cults with “tom tom pounding” and human sacrifice, and subversive forces in the shadows. In other words, what I enjoy as brilliant horror literature (and the occasional role-playing evening) and what religious practitioners use (seriously or not) as magical tradition and ritual symbols, can be embedded in other rhetorical contexts outside the cultic milieu, namely anti-cult fears and moral panics. Whether these fact-fiction reversals are conscious or not, they supply viable stereotypes and powerful atrocities that works in a media context. These, in turn, can find their way back into the cultic milieu and supply additional material or even legitimation as they are re-embedded into yet other discourses.